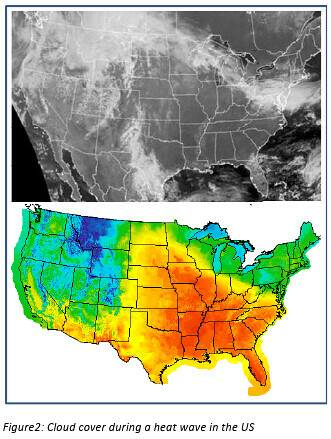 A letter last week asked, "Do you have solar energy yourself?" Why yes, I do. 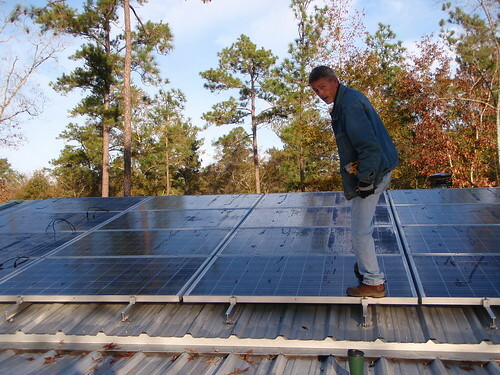 When we installed solar panels on our farm workshop in 2009, the closest certified solar installer was in Marietta. There were only four in the state. Now there are forty. Georgia may yet catch up with North Carolina and even New Jersey! Grady Blankenship wrote a LTE in the VDT Wednesday, in which he asked "do you have solar energy yourself?" Why yes, yes, I do. And I have some questions for everyone at the end. 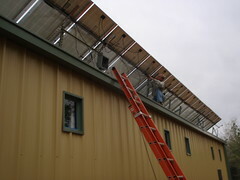 Back in 2009 we installed solar panels on our farm workshop. 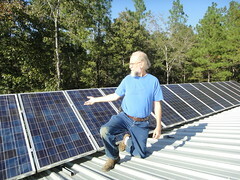 At the time the closest certified solar installer I could find was in Marietta. Four years ago there were 4 in the state. now there are forty. And that's in a state that's trailing North Carolina and even New Jersey in solar installations. We could do something like this. We've already made a start with Wiregrass Solar. At an event this afternoon at UT-San Antonio, Mayor Julian Castro announced a suite of green energy projects that he said would position San Antonio as the nation's "recognized leader in clean energy technology" and help fulfill his aggressive environmental goals. Most notably, Castro and leaders from CPS Energy, the city-owned utility, pledged to shut down one of its coal-fired power plants 15 years ahead of schedule. By 2018, the city would mothball the 871-megawatt J.T. Deely Power Plant — a bold move in a growing state that's seemingly addicted to coal. So what are they going to use for energy? Responding to George Rhynes' point, I said that while I had recommended moving Citizens to be Heard to the end of the agenda, it never occured to me that it might get moved after Council Comments, which did lead to an impression that Council did not want to hear and did not plan to respond. I noted that if Council videoed its own proceedings and put them on the web, that would help make the problem moot. I'm thinking videos distributed by the City Council itself would probably get more citizens viewing them than ones distributed by bloggers like me and George and by LAKE. Congratulations on the Wiregrass Solar commissioning. Since this was not ever the largest array in Georgia let's encourage Mayor Fretti and Commissioner Powell to help VLCIA expand the local array. 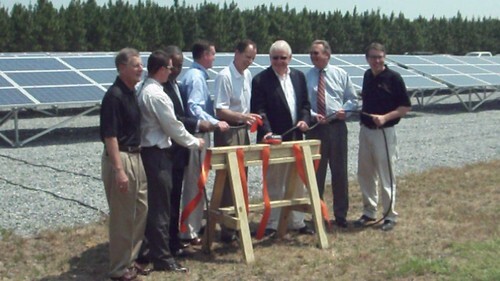 Let's look at Sterling Planet's own press release about the Wiregrass Solar commissioning. What's this about a first phase? And what's the second phase? Sterling Planet announces completion of one of Georgia’s largest solar generating projects: First phase of Valdosta solar project now supplies green energy to Georgia Power. Sterling Planet, the leading national retail provider of renewable energy and other clean-energy assets, today announced at a commissioning ceremony the completion of a 200 kWAC output solar generating project in Valdosta. One of the largest solar arrays in the state of Georgia, the Wiregrass Solar, LLC project began commercial operation on April 6 and is now generating annualized output of approximately 350,000 kilowatt-hours. This is enough clean, emission-free electricity to power 350 Georgia homes using the average amount of 1,000 kilowatt-hours of electricity monthly. Developed by Sterling Planet, Wiregrass Solar supplies green power for the Georgia Power Green Energy program, an option for the utility’s customers who voluntarily choose to support renewable power and help generate more of it in Georgia. OK, that's all good. Congratulations! Also notice Sterling Planet doesn't make the mayor's mistake in saying this is the largest solar array in Georgia, like WCTV after Pete Marte of Hannah Solar corrected it, Sterling says "one of the largest". But what's this about "first phase"? Congratulations on the commissioning ceremony for Wiregrass Solar! Allan Ricketts (Acting Executive Director, VLCIA), Georgia Power rep., Roy Copeland (VLCIA Board member), Crawford Powell (Lowndes County Commissioner), John J. Fretti (Mayor of Valdosta), Therrell "Sonny" Murphy (Chairman of Sterling Planet), Tim Golden (Georgia State Senator), Pete Marte (CEO of Hannah Solar).